Postcard from the early 1900's published by S. Hill of Paglesham. Probably the earliest view of the top end of Ferry Road in existence. At this time Ferry Road was simply known as High Road, High Street or Main Road according to who you spoke to. It was around 1920's/30's when it became known as Ferry Road. On the extreme left of the picture is the Mission Hall built 1890. Further on there is Shell Cottage then of tarred weatherboard construction and two other adjacent houses. In the distance is the old Church of England Chapel recognizable by the church like window on the side wall. Built by public subscription in 1856. The Rev. John Harding curate for the parish visited the Chapel once a week to preach. The building was in regular use for church services until around 1886. It also served as the school room until 1902 when the council school was opened. The Chapel was eventually demolished about 1920. 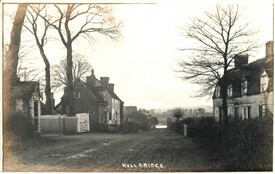 On the right of the picture is Well Cottages before they became shops. Also of interest is the completely unmade state of the road and the gas lit lamp post near the old Chapel. This page was added by David Whiffin on 24/08/2013.